Housing & Community Solutions Inc.
Walk/Live St. Louis 2012 Was A Success! Thanks to all of you who attended Walk/Live St. Louis 2012! Go to our event material page for photos, slideshows, and links from this successful event. Last year, Dan Burden – one of Time Magazine’s “most important civic innovators” – guided a walking audit in the City’s West End neighborhood. This year, through walkability workshops at the Delmar MetroLink Station, Wellston MetroLink Station, and a University City elementary school, Burden returned to St. Louis to expand the reach of his expertise to the wider St. Louis community. 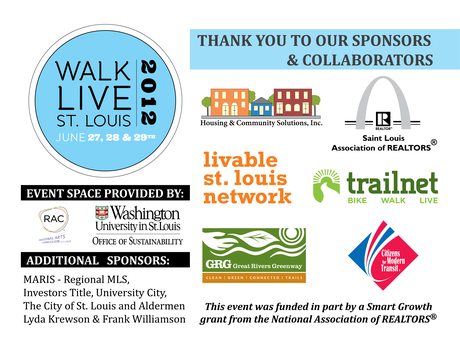 The 2012 event was brought to you through a collaboration between Housing & Community Solutions, Inc., the St. Louis Association of Realtors, Trailnet, the Livable St. Louis Network, and Great Rivers Greenway. A Smart Growth grant awarded by the National Association of Realtors made this event possible. 26th Ward Alderman Frank Williamson talks about the positive impact HCSI had on the West End neighborhood through last year's Dan Burden walk audit. Video by Caroline Ban. Produced through the Nine Network of Public Media. The 2011 West End walk audit displayed how the work of Housing & Community Solutions can help build better communities. The above shows critical lessons from the event, and serves as an example for how Walk/Live 2012 impacted the region. In March of this year, HCSI helped bring Dan Burden to speak at the Federal Reserve Bank of St. Louis' "Exploring Innovation" week. You can watch a video of HCSI's President Eric Friedman's introduction here, and watch Dan Burden's presentation here. Housing Solutions, Inc. (HS) was founded in 1980 as an affordable housing development organization. There were plans to close HS and in 2004 the board appointed two new directors — Eric Friedman and Terry O’Bryant — in place of the previous board. In 2006, HS added two board members and changed its name to Housing & Community Solutions, Inc. (HCSI), expanding its mission to include community and economic development. HCSI’s mission is to build sustainable and diverse communities through projects that promote collaboration & community and economic revitalization in the St. Louis region. HCSI’s vision is to make St. Louis an inclusive and energized community where people of all social, racial and economic backgrounds will want to live, work and play. Check out the St. Louis Social Compact DrillDown website, www.DrillDownSTL.org , where you can sign up for our email list. The DrillDown data is almost here! Be one of the first to see the findings. East-West Gateway has released the newest report since 2006 telling St. Louis "Where we Stand." It shows how the St. Louis region compares to other large metro areas, through 129 rankings such as cost of living, crime, education, employment, health, government, demographics, and more. Click here to find the full publication.